I received this book for free. This book was brought to my attention through direct email contact with the publisher, T Squared Books. This book was sent to me in exchange for an honest review. 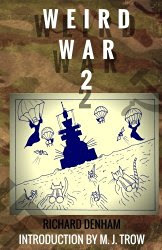 Synopsis: Welcome to the wonderfully weird World War Two ... The Second World War is the bloodiest on record. It was the first total war in history when civilians; men, women and children were in the front line as never before. With so many millions involved, the rumour machine went into overdrive, tall stories built on fear of the unknown. With so much at stake, boffins battled with each other to build even more bizarre weapons to out-gun the enemy. Nazi Germany alone had so many government-orchestrated foibles that they would be funny if they were not so tragic. Parachuting Sheep? Pilot Pigeons? Rifles that fire round corners? Men who never were? You will find them all here, the weird, wonderful and barely believable of World War Two. Review: I would like to thank T Squared Books and the author for providing me with a copy of this book. I requested a copy of this book as I have an interest in World War Two and the events that took place during the war. This book was a truly interesting read and I enjoyed learning about inventions, ideas and people involved in World War Two. The things talked about in this book are not the most well known facts about World War Two so it is nice that they have been put all together in one book so it is easy to get a copy of and learn some unusual things about the war. I would recommend this book to anyone with an interest in history and World War Two because this book is as informative about unknown ideas and inventions as it is interesting. I found this book to be gripping and kept me trapped the pages for long periods of time. After reading this book I definitely want to invest in more books by Richard Denham and M.J. Trow. I am certain that this book will remain a part of my ever-growing book collection for all time.